Outdoor Decorations: Decking the halls with seasonal ornaments is a great way to bring the holiday spirit home. Many love to spread the joy by decorating the outside of their homes and front yards as well, but before you scurry up that ladder to hang the decorative lights along the side of your roof, take a quick peek at the CC&Rs to find out the guidelines for outdoor decorations, as well as the guidelines for flags and signs if you plan on decorating with those. This will help make sure your outdoor winter wonderland isn’t an association violation. 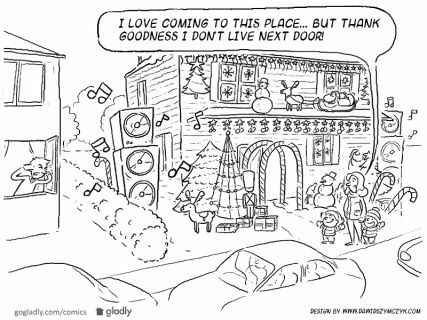 Also remember to take those decorations down in January to avoid getting a violation notice. Parties: We hope you all have plenty of chances to eat, drink and be merry this holiday season. If you plan on hosting a large get-together or party, there are a few things you’ll want to keep in mind. First, keep the revelry and noise to a minimum, and wind the party down at a reasonable time—you don’t want your celebrating to interfere with your neighbors’ attempts to get visions of sugar plums dancing in their heads. Check your CC&Rs to find out what the association deems acceptable noise levels and what the quiet hours are, as well as guidelines for hosting parties. Parking: The holidays bring many people together, and that means extra cars will need to be parked. To make sure your guests are covered, look at the CC&Rs to find out the rules on visitor parking in the association, including where they can park and what kind of parking passes they may need. Overnight Guests: It wouldn’t be the holidays without Uncle Marv and Aunt Ethel bunking in little Jimmy’s room. Of course, depending on how long your overnight guests are staying, you may need to let the association know. The CC&Rs will give you a breakdown on the rules for both short-term and long-term guests, so take a look at them before you break out the extra cot. Following the association’s rules and regulations helps ensure that all of our residents can enjoy this special time of year, so please help us by doing your part. Stay safe and have a wonderful holiday season.